Sound insulated doors made of Mild steel provide optimum protection against high level noises. These Acoustic Doors reduce noise pollution, increase efficiency and ensure maximum health benefits. Due to the special design of the door leaf, very compact insulation material and special seals, the doors achieve optimum insulation. Our personnel aids us immensely in delivering a comprehensive range of Sound Proof Doors. 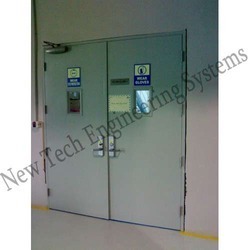 This range of sound proof doors available by us is developed utilizing superior grade steel in compliance with the international quality norms and standards. In addition to this, the offered range is available in single & double leaf doors. The offered range of sound proof doors offered by us is appreciated for its low maintenance, durability, reliable operations and precision engineering. Looking for Acoustic Door ?